Should You Close a Paid Credit Card Or Leave It Open? Should You Close a Paid Credit Card? Paying off a credit card is a great accomplishment, especially if you worked long and hard to do it. What now? Do you leave the card open or should you close it? You could keep the credit card, but there are a few good reasons for closing a card you've paid off. 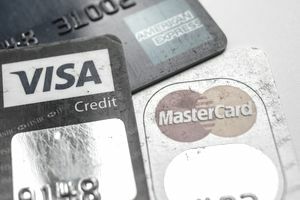 You may feel that you have too many credit cards and want to minimize the number of accounts you have to keep up with. Even a credit card with a zero balance has to be monitored regularly to spot any unauthorized charges. Closing a paid credit card could make it easier to manage your finances. This credit card may be one that you had when you first started out with credit. It may have a low credit limit or high-interest rate while your other credit cards have better limits, low rates, and rewards program. Getting rid of a credit card that no longer benefits you is a good idea. After you've worked hard to pay your cards off, the last thing you want is to max them out again. If you think having an open credit card will tempt you into racking up more than you can afford to pay, closing the credit card is better than getting back into debt. While there are some advantages to closing a credit card you've paid off, it's important to know what closing a credit card won't do for you. For example, many people think closing a credit card will improve their credit score. Unfortunately, it's more likely that closing a credit card—even a paid one—will hurt your credit score rather than help it. Closing the credit card also won't remove it from your credit report. The account will remain on your credit report until the credit reporting time limit has expired. That's seven years if the account was closed with a negative standing, like a charge-off. An account closed in good standing will stay on your credit report based on the credit bureau's timing for reporting closed accounts. Should You Leave the Account Open? Leaving a paid account open can benefit you in certain circumstances. Consider leaving the account open if it's the only credit card that has available credit. Having this card is helping your overall credit utilization, which makes up 30% of your credit score. You should also keep the account if it's your only credit card. Your credit score benefits from having a mix of accounts on your credit report. That means you'll have a better credit score if you have both credit cards and loans as part of your active credit history. Some credit card issuers close credit cards that go unused for several months. To keep your account open, be sure to use it periodically. Make a small purchase on the card every three or four months and pay off the balance right away to keep it active and open.